These cookies feature the rich, nutty flavor of brown butter, and are a twist on the classic holiday sugar cookie. 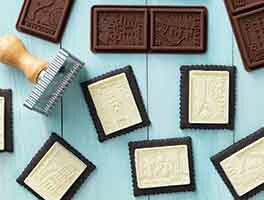 They come out beautifully decorated in one easy step, when made with cookie stamps. And the buttery, sweet glaze takes their flavor to new heights. 3 hrs 34 mins. to 3 hrs 51 mins. To make the brown butter: Melt, then cook the butter in a saucepan over medium heat, swirling occasionally, until golden brown, 5 to 10 minutes. Reserve 1 tablespoon of brown butter for the glaze, then pour the remainder into a heatproof container. Cool the butter slightly, then refrigerate until solid, about 2 hours. To make the cookies: Stir together the flours, salt, and baking soda. Set aside. Beat the chilled browned butter until soft and creamy. Add the sugars, then the egg and flavor, beating until light and fluffy. Stir in the flour mixture; then add the water, stirring to blend completely. Divide the dough in half, flattening each half slightly to make a disk, and wrap in plastic. Refrigerate for at least 1 hour. Preheat the oven to 350°F. Lightly grease two baking sheets, or line them with parchment. Working with one piece of chilled dough at a time, place the dough on a lightly floured surface and roll 1/8" to 1/4" thick. Dip the cookie stamps into flour, then press them into the dough. 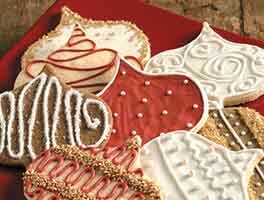 Using a 2 3/4" round cutter, cut out stamped cookies and transfer them to the prepared pans. Bake the cookies for 14 to 16 minutes, until lightly browned. Remove the cookies from the oven, and let them cool on the baking sheet for several minutes, or until set. Transfer the cookies (on their parchment) to a rack to cool completely. To make the glaze: Combine the reserved butter with the remaining ingredients, adding enough milk to make a thin glaze, about the consistency of syrup. Brush the glaze onto the cookies and allow to set. 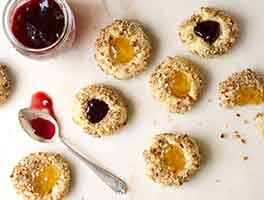 If you don't have cookie stamps handy, these can be made as drop cookies. You'll need to flatten them to 1/4" thickness with the bottom of a glass before baking, as they won't spread much on their own. I liked the flavor but the dough was extremely hard to roll. Just too dry. I'm not going to make it again but if you do I would recommend reducing the flour a bit. I baked these cookies last Christmas and was very satisfied. I did not use the stamps, but just cut them out with a flower shaped cutter and glazed them. (I thought I'd try them before I went to the expense of buying the stamps) I really enjoyed them and will make them again in the future. The have a very subtle flavor and are not real sweet which I find very refreshing. Had lots of compliments on them from others. I'm having so much fun and success with these stamps. The recipe is great and I have a question about the glaze. My friend would like me to make these cookies with a Royal Crown glaze. May I substitute the milk in the recipe for Royal Crown? Any suggestions? Thanks! Unfortunately this recipe was a miss for me. The cookies baked up nicely, very pretty, but had bland flavor and a terrible aftertaste. I wasn't able to give them as a gift as I'd planned. Another winning recipe. Although I am very fond of butter cookies these were even better. The browned butter flavor made these special. My technique with the stamp needs improvement but they were pretty anyway. 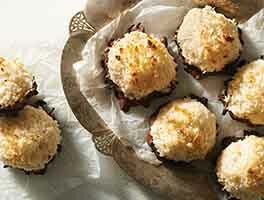 The perfect cookie to go with a cup of coffee or tea. I'll make them again soon. This is a great recipe. Not only is it delicious, it held the imprint better than any stamped recipe I've tried. Grandchildren will be painting cookies (I used different stamps) and I wondered if I should leave off the glaze. This is definitely a keeper to show up every Christmas. Even though I said yes to the above questions, I have not baked these, because I need a substitute for the whole wheat pastry flour. My recommendation is with hesitation. My cookies tasted good, but were lacking the brown butter flavor. I'm wondering if I didn't brown the butter enough and are you supposed to add the very brown bits of butter in the bottom of the pan? I had no problems with the stamp design. Fabulous flavor. Wonderful cookies for the holiday season!